Welcome To Legends in Landscape! 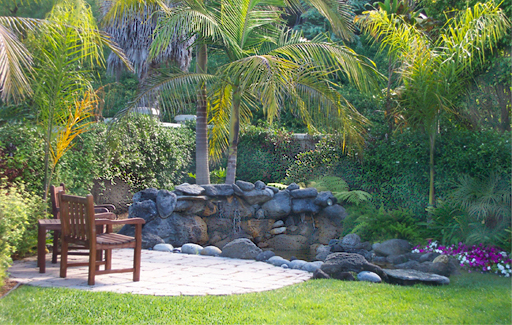 Yvonne English is a certified landscape, pool and outdoor lighting designer as well as a licensed California landscape contractor, giving her experience in all facets of landscaping. Its also no surprise that Yvonne applies an engineering mindset to her landscaping creations thanks to her Masters in Computer Science (with an emphasis in graphics). While Yvonne enjoyed the challenges of engineering, she longed to better utilize her creativity. It was not until Yvonne worked with an architect to design her own custom home that she turned her interest towards landscaping. Her vision for her property included an unusual yard with a water feature and perennial gardens to complement her new home. After several unsuccessful attempts to relate to landscape designers, Yvonne decided to pursue classes in horticulture and landscape design. She has studied with 7 different renowned landscape architects over the past 12 years. In 1994 she used her customer-centric vision to begin designing and building landscapes for others. Yvonne specializes in creating swimming pools and outdoor kitchens .Yvonne has extensively studied a wide variety of plant materials (Trees, Shrubs, Perennials, Ornamental Grasses, and Tropicals). Yvonne also loves to give her landscape creations a nighttime dimension with sparkling lighting design & installation as well.